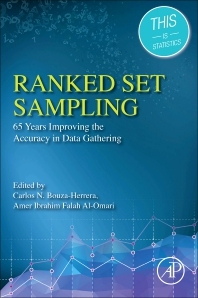 Ranked Set Sampling: 65 Years Improving the Accuracy in Data Gathering is an advanced survey technique which seeks to improve the likelihood that collected sample data presents a good representation of the population and minimizes the costs associated with obtaining them. The main focus of many agricultural, ecological and environmental studies is the development of well designed, cost-effective and efficient sampling designs, giving RSS techniques a particular place in resolving the disciplinary problems of economists in application contexts, particularly experimental economics. This book seeks to place RSS at the heart of economic study designs. Prof. Dr. Carlos Bouza-Herrera is Professor of Mathematics, Economics and Computation at Universidad de la Habana, Cuba. Herrera has headed more than 60 research projects and published more than 200 papers. His main area of investigation is in mathematical statistics. He has been author, coauthor or editor of 19 books. He is the consulting editor of Current Index to Statistics and International Abstracts of Operations Research. Professor Amer Al-Omari is a Professor of Statistics at the Department of Mathematics, and Vice-Dean of Academic Research at Al al-Bayt University, Mafraq, Jordan. He is interested in ranked set sampling, entropy, missing data, order statistics, acceptance sampling plans, and statistical inference. He has published over 100 articles.